We have been running our ‘Never too Old’ course every Friday for quite a few years now and have continued it through Adult Community Learning funding this year. People come from various different sources and some have been referred to us through the Health Trainers on the Island. 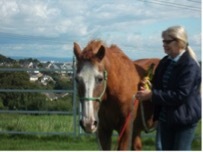 One such learner came to us who used to do things with horses but she had lost her confidence and when we first met her she would not make eye contact, shook with nerves, would not have her photo taken and found writing traumatic. Erica Myers, Health Trainer referred her to us and brought her in the winter for an initial visit. When she arrived she was so nervous she was shaking. She almost broke down in tears when we asked her to fill in the registration form and we and Erica did most of it for her. She changed when she met the ponies and Erica was shocked to see her smile as she began to groom Tippy. This first visit was in fact quite emotional. This particular learner is very isolated due to her nerves and lack of confidence. However she stayed for the whole session and agreed for Giles to collect her from outside her house the following week. She has been coming most Fridays ever since. Since coming to Bodster CIC this learner’s confidence has increased amazingly and she now will happily have her photo taken with the ponies, enthusiastically chats to the others in the group and even has arranged for a lift home with one of the other learners. She is no longer feeling isolated. She even came with us when we went to do the 1000+ project with another tutor at Westridge, the Adult Learning Community Centre on the Isle of Wight and although nervous was happy to join in this session in an unknown environment. Her love of horses is so evident and she happily asks to help do jobs around the yard on Friday mornings and loves the interaction with the ponies. Although she did a lot with horses in her early life she happily listens to how we work using Natural horsemanship and willingly has a go at new tasks with the ponies. She now has a folder with photographs in it and will complete written work in the file without shaking. She has become a real part of this group and welcomes new learners when they join. Giles collects her each week and she will give us a ‘call if she can not make a session for some reason although this is not often as she so enjoys coming. Erica visited recently with some new learners and was amazed to see how this learner’s confidence had grown.